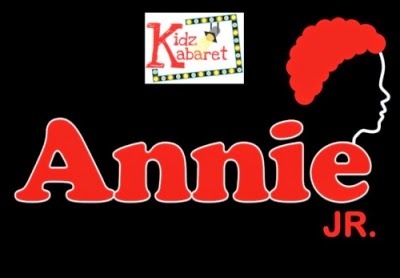 Kidz Kabaret presents Annie, Jr., their first full-scale musical. Performances are August 1, 2, 8, and 9 at 7:30 p.m. and August 3 and 10 at 2 p.m at Cité des Arts (109 Vine St., Downtown Lafayette). Tickets are $10 and can be purchased online at citedesarts.org or reserved by telephone at 337-291-1122. The cast of 24 children are between the ages of 8 and 16 and have been rehearsing all throughout the month of July to present this classic Broadway musical directed by Kidz Kabaret artistic director, Travis Guillory. Based on the popular Broadway musical, which was adapted from the comic strip “Little Orphan Annie,” Annie Jr. tells the story of a spunky, Depression-era orphan who is determined to find her parents, who abandoned her on the doorstep of a New York City orphanage run by the cruel Miss Hannigan. During adventure after fun-filled adventure, Annie foils Miss Hannigan’s evil plans, befriends President Franklin Roosevelt and finds a new family in billionaire Oliver Warbucks, his personal secretary Grace Farrell, and a lovable mutt named Sandy. The musical features a book by Thomas Meehan, music by Charles Strouse, and lyrics by Martin Charnin. Kidz Kabaret is a theatre education program that showcases the theatrical talent of children ages 8 to 13. The goal is to give each child an opportunity to perform while learning about all aspects of musical theatre through specific curriculums. It focuses on the individual child and his or her unique talents and abilities.